Ms. Veronica Caceres, Sea Turtle Secretariat, wanted to share her message of endangered sea turtles as shared natural resources of all coastal countries. Consequently, she accepted an invitation to be a guest lecturer at Shorecrest Preparatory School. 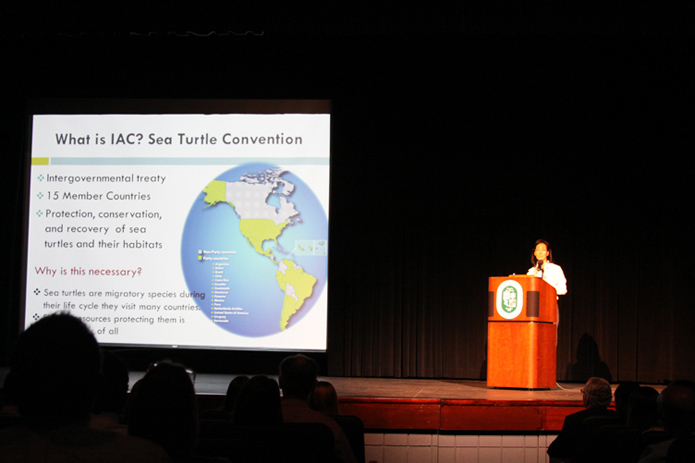 She hoped to offer high school students insight into the workings of an international treaty organization and to promote cooperative sustainability initiatives in the community that may become the Inter-American sea turtle treaty host. Shorecrest Preparatory School was very pleased to have a Secretariat Pro-Tempore explain the international treaty dynamics in an important ecological policy making body such as the Inter-American Consulate. The Secretariat Pro-Tempore (Pro-Tempore because there is not yet a permanent host for the Secretariat) organizes, supports, and runs the sea turtle convention comprised of the fifteen countries that participate in the treaty. Shorecrest welcomed the opportunity to hear Ms. Caceres’ perspectives on international and sustainable policy making, an activity applicable to many subjects. Additionally, Shorecrest’s Global Scholars Initiative, which is a group of students and faculty dedicated to following international issues, politics, and relations, was particularly interested in hearing about international treaty politics. The Secretariat began her talk focused on sea turtles. She explained turtles are reptiles that breath air and she filled in the details of the life cycle of these land and sea animals. She later explained that “sea turtles, like, say, pandas, are deeply charismatic creatures,” and it is important to begin their protection by encouraging the international cooperation required to save these animals who travel the world under the sea.” Before discussing the international treaty in depth, she explained many real impacts are best achieved locally, and she encouraged students to help sea turtles on their own beaches. Ms. Caceres focused her address on the international sea turtle treaty around the need for cooperation. International treaties always rely upon the collective strength of member nations who must recognize each others’ different interests and still forge an agreement that benefits conservation. She explained that her recent effort to include more countries in the Inter-American group is intended to reinforce each decision the convention makes. Her last point was that in our diverse world getting information to a widespread audience is a challenge. This is as true around the convention’s negotiating table as it is out in the field and on the coasts. She pointed to the example of impoverished South American fishermen in Argentina. These fishermen come in contact with sea turtles every day, yet reaching these working people about sea turtle safe fishing nets can’t be done with notices or published information. To illustrate one method they have used to reach local fishermen, she showed a humorous Spanish speaking video using cartoon fishermen and mermaids working together to free turtles entangled in nets. Such inventive videos are unconventional and perhaps memorable in poor fishing communities.